Barbecue is hard work. Burt Bakman, the pit master behind the soon-to-open Slab BBQ, knows that all too well. 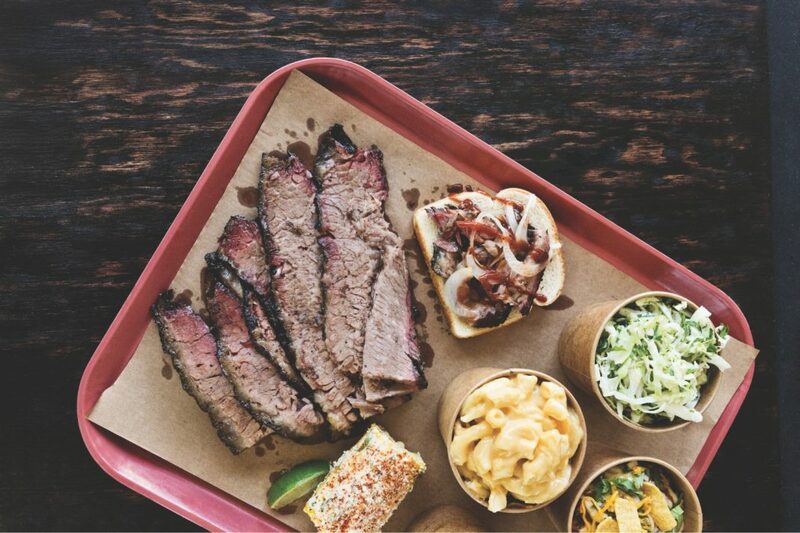 The self-taught brisket whisperer gained fame using the Instagram moniker Trudy’s Underground Barbecue this past year, preparing show-stopping Texas-style ’cue in his Studio City backyard using a $12,000 custom rig. Time to start the fire. Bakman lights red- and white-oak logs in the smoker’s fire chamber. Briskets (trimmed and cleaned the day before) are rubbed with yellow mustard, which helps a mix of salt and ground black pepper to stick, forming a “bark” as it smokes. When the smoker hits about 200 degrees, the meat goes in, fat side up. Billowing from the chimney should be what pros call “thin blue smoke,” a near-invisible stream of exhaust that means the fire is burning clean. If the smoke looks cloudy, it could lead to harsh flavors. Every half-hour or so for the next 15 hours, Bakman will tend the fire, making sure the temperature hovers between 250 and 270 degrees. He’ll also spray the meat occasionally with apple cider vinegar to add color. “Don’t open the lid too much,” he says. Having developed a rosy “smoke ring” beneath a peppery black crust, the briskets are taken out and wrapped with butcher paper before being popped back in. This step keeps the meat moist for the last few hours of smoking while it is still absorbing flavor. Bakman removes the finished meat and rests it overnight to “let the juices even out.” Depending on the weather, it’s stored in an insulated cooler or in the smoker itself, kept warm by leftover embers. The next morning it’ll be ready to be sliced (against the grain). Slab BBQ (opening soon), 8136 W. 3rd St., Beverly Grove. Next articleWhere Was There a Drive-In Theater in Los Feliz? Texas Barbecue Buff Crowns California’s Best Brisket—and It’s in L.A.